How long does it take to become a legend? Big news this month in NZ is Hairy Mclairy's 30th birthday. First Hairy McLairy book published in July 1983- so Mark you are older than the legend from Donaldson's Dairy. 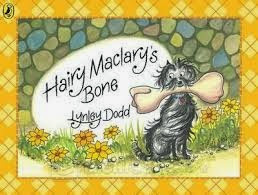 I think we got our first Hairy McLairy book for Mark's first Christmas - pretty sure it was Hairy Mclairy's Bone. Certainly Bottomly Potts, Muffin Mcllay, Schnitzel von Krumm and the rest of the gang were very much part of our vocabulary from Mark's very early days. I do remember Craig Simpson getting the Scarface Claw book and being terrified of it. Much to Yvonne's dismay Craig threw the book away - that hit the English teacher from Aranui very hard Throwing away a book was unthinkable but we never did see it again. By the time Maria outgrew Hairy McLairy books we had a pretty extensive collection across our house, Nana's and Gran's. Looks like they remain as popular now as they were in your childhoods. Legends in your lifetime.